I love that you used an English Muffin! Actually I never seen one look so pretty!! Love this sandwich, it just looks gorgeous!!! Happy Monday to you!! These look amazing!!! I’ve never driven myself to the airport, but I would definitely be paranoid I would forget where I parked. I’m awful with stuff like that. I am a biiiig fan of these burgers. They’re delightful! I love using an English muffin. Buns so often just get soggy and gross. English muffins do have that awesome crustiness to them. 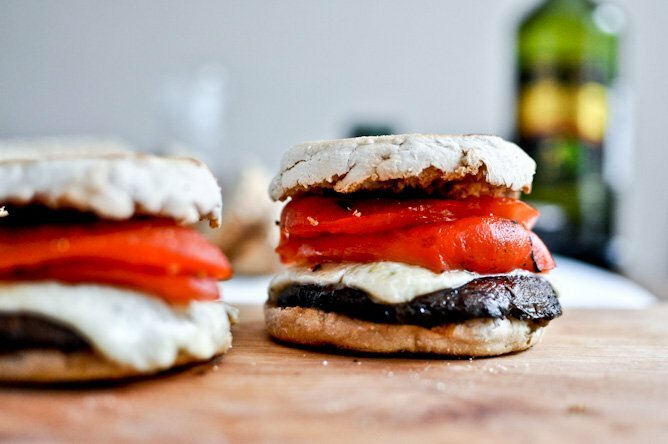 I can’t stand mushrooms, but you’ve got me craving these burgers! Pinned and can’t wait to try. Been there. Thinking that you can totally find it, walking the parking lot back and forth acting like you know where you’re going, while sweat drips down your forehead, trying to find the best curb you will surely have to sleep on because the car will NEVER show it’s face. That has definitely happened to me before and I will never, ever ask for help because I’m convinced that if it’s not there, someone stole it. Totally not dramatic or anything. Can’t wait to make these burgers! Roasted red peppers = love. yum! those burgers look awesome!!!!!! Airport parking lots are huge, and that has happened to me before, too! 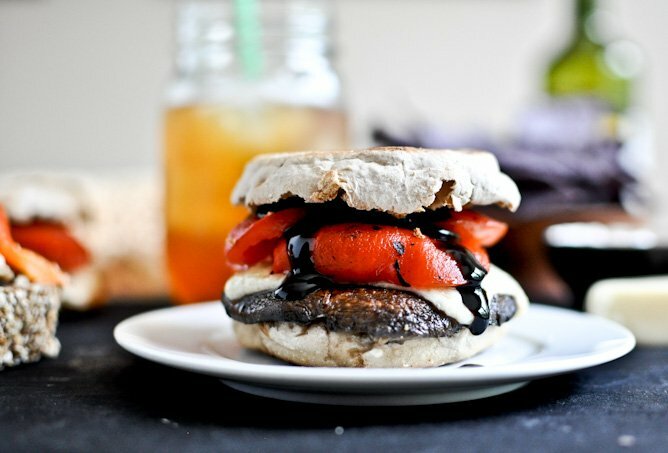 This portobello burger looks amazing, Jessica. I love the english muffin! Also, speaking of blackberry grilled cheeses…i made them on english muffins. because i don’t buy bread. because i have a habit of eating the entire loaf in one sitting. and oh my god they are awesome. 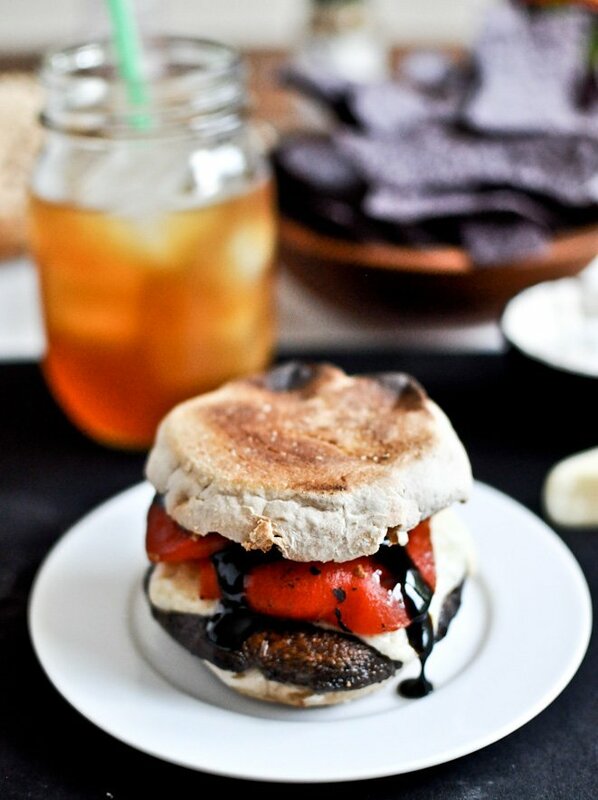 Only you could make an English muffin look so fancy schmancy! Great recipe! I love bello-burgers! These look fantastic! I’ve only eaten portobellos as a burger (and that’s a feat in and of itself since I don’t like mushrooms — or at least I say I don’t). I’ve never made them at home, but maybe I should give it a try since these look ah-mahzing. I’m so paranoid about “losing” my car in an airport parking lot that I always right down explicit notes on where I parked, to the point of true nerdiness. 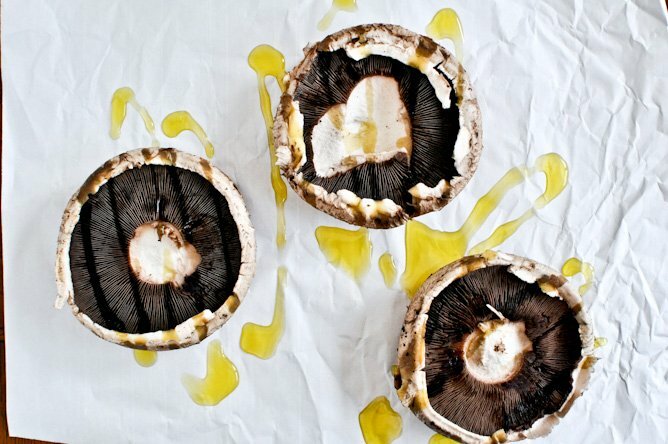 These shroomies look good – I always marinate mine but I’m going to go the route you went next time. Smoked paprika always makes everything heavenly! Losing my car in a parking lot… a massive airport parking lot… is like, my worst nightmare! And something that would totally happen to me. 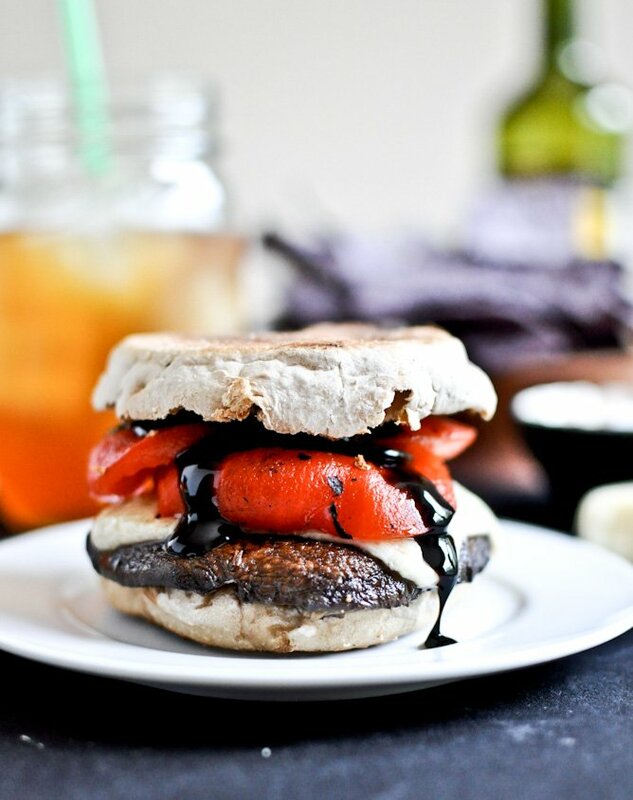 These portobello burgers look great, especially with that thick balsamic glaze + toasted crunchy english muffins… i love english muffins, but have never seen them look so fancy schmancy! A balsamic glaze? Oh ya, I can see why these would be super amazing! I can totally have this for breakfast with arunny egg on top! Yup, always hitting the panic button to look for my car, even in mall parking garages. It’s a problem. I just want to crunch right into these things. you know, that sounds exactly like what happened to me after foodbuzz. denver’s airport parking is ridiculous and i didn’t even remember what lot i was in and TOTALLY turned down like 5 security guys who were offering to help me find my car. and then i called nate and told him (seriously) that i thought my car had been stolen. 45 minutes later i found it. oops. Glad you finally found your car! Also I could eat balsamic glaze with a spoon. So good. Mmmm yum! This reminds me of a caprese sandwich I had in Oregon over the weekend. So yum. Also, loved seeing the IG photos of you all over the place. Sure wish I’d been in Seattle! Glad you found your car! And enjoyed these portobello burgers! make them perfect for burgers. Gorgeous! I adore portobello burgers. And so love that you used English muffins! What an amazing burger! I’ve not been craving meat as much as I usually do, so this looks just perfect. …Sorry about the airport situation–so frustrating. These look so good. I’m sure they’d taste good as a salad, without the English muffins too! Oh No! I’m so sorry- that is terrible about your car. How annoying. These burgers make me so happy. I am a single mom all week and Pia and Coco are actually obsessed with mushrooms, so I may make a play for them to try them burger style and see how it goes. If not well, I will eat all three. Miss your lovely face already. Um, I’m getting back on a plane immediately to come eat mushrooms with you, Pia and Coco. I miss you more! I love how completely honest you are about life and your goings on lol. Too funny. Wait… I’m not the only one who gets anxious thinking about what I’m going to eat in 4 hours?! This looks amazing! Oh I wish I would’ve bought those portobello caps at Sam’s! Oh darn…a reason to go back! I was in the same situation a couple of weeks ago. I walked out of the terminal into the parking garage, went to where my car was parked (I had even taken a picture so I would remember!) and it wasn’t there. Convinced my car was stolen, I called my boyfriend crying. He then reminded me that I was parked on the 5th floor, not the 2nd. Ha! On a related note, I have no idea who in their right mind would steal a 2002 (horribly dirty) Nissan Altima. But it made sense at the time. Sounds like a great way to switch up the typical summer burger! Swoon! These look stunning! I’m a big fan of portabello burgers, so no arguments here about having multiple recipes. I’ve done the same thing in an airport parking lot before, finally calling security for a location on my car. The best one though was when I was leaving a hospital at midnight after my goddaughter was born and I had been fretting there for 20 hours. That time, I had to drive around with security in their little golf cart. Oh the shame! I hate driving myself to the airport too. And am filled with anxiety every time I have to find my car after leaving it alone for days. I don’t know why, but I’m always genuinely shocked that it’s still there. Safe and sound, right where I left it. Oh man, I’m glad I’m not the only one. ;) I have done that so many times!! But onto this burger, I could seriously this every day. Awesome recipe. I love healthy(ier) burger options! These would be a delicious Meatless Monday treat too! OH good gosh. I seriously want that right this very instant. I made these tonight for my meat lovin’ husband and he approved! and so do I. these are so good. Thank you!